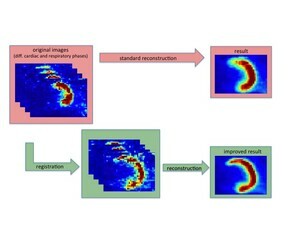 Reconstruction of PET images is visibly improved using automatic motion estimation and correction. Positron Emission Tomography (PET) allows a three-dimensional visualization of heart function and thus provides important biomarkers for preterm diagnosis of cardiovascular diseases. However, patient movement due to heartbeat and respiration introduces motion blur which complicates an accurate diagnosis in practice. In cooperation with the Collaborative Research Center (Sonderforschungsbereich) 656 in Münster, researchers of the Institute of Mathematics and Image Computing developed algorithms for automatic motion estimation and correction. For more Information see http://vampire.uni-muenster.de.